After a long journey at around 2pm, all cars made it safe to Hockenheim. With the help of our friends from Rennteam Stuttgart and a few early arrivers from our team, we were able to secure a good spot at the camp ground. Cheers Rennteam! Directly after arrival, the registration and scrutineering numbers were announced, which were results from the scrutineering quiz in April. We secured the 99 and 90 spot, which were not optimal results for us. The event area opened up at 6PM and we moved into our pits while our drivers absolved the driver registration. The first day finished with a scrutineering briefing and the welcome ceremony. The first wake up call of this event started at 7:30AM. All of us were very excited for the first day although we were expecting a long wait until getting called for scrutineering. We used this waiting time to double check our cars. A mechanical control was done and some resistors on the eCar changed. 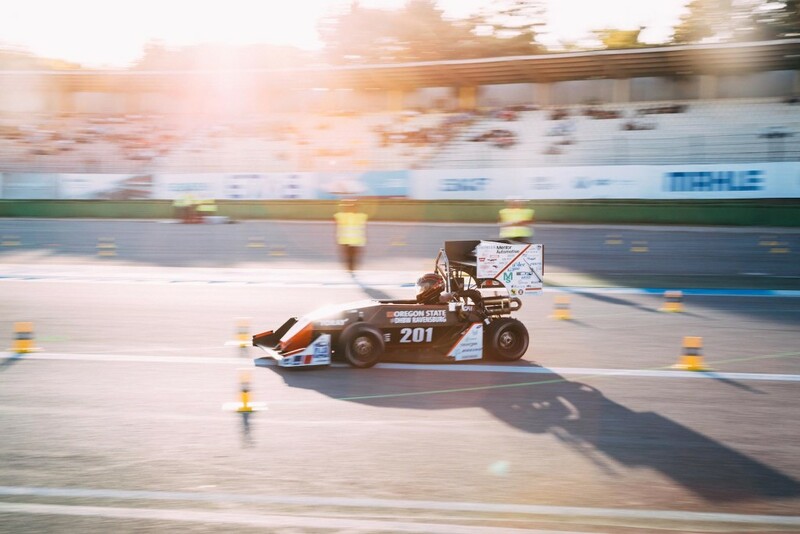 Luckily the scrutineering was extended until 9PM as only a limited number of teams were able to complete scrutineering, which allowed us to get started with the eCar battery-scrutineering. Today the first team and driver briefing took place. All flag colors and the track and testing areas were explained as we received a summary of the day and weather. Afterwards we continued the eCar battery scrutineering. We finished at noon and were able to start pre-scrutineering. At the same time, our eCar business team had their presentation, followed by the design and cost event of the eCar. 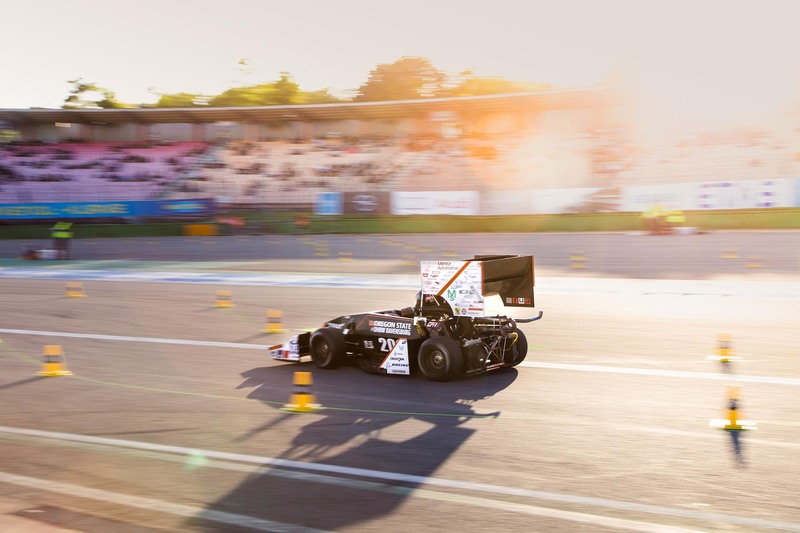 The detailed feedback of Formula Student Austria allowed us to improve our presentations, which allowed us to go into the business presentation finals. The whole team went to see all finalists in the evening before we went back into the camp. 6:45 – Good Morning GFR! As usual, we started our day early to make it in time to the team briefing at 7:30AM. Our motto for the day could be described by “Statics for the cCar, Scrutineering for the eCar”. Motivated from the great performance of the eCar business presentation, our cCar had to show and prove its concept in front of the judges today. We succeeded again and got into the finals, where we presented in front of all participating teams. Next to the business presentation, we also absolved the design and cost event. While the cCar was busy with absolving all those statics, the eCar finished scrutineering. As the cCar already accomplished this the day before, we did a short test drive before skidpad. Meanwhile, time got close for the eCar. Luckily we were able to finish with scrutineering right in time to absolve both skidpad runs before the track got closed. The long day finished with the first part of the award ceremony. We celebrated the first place of both of our business presentations and the second place for cost report. On the penultimate day of this year’s FSG events it came down to collecting all the important points for the final results. The focus for the day was dynamic events, acceleration and autocross. Before we started the day the team had it’s daily briefing at 7:30 am. At 8:30 each team had the opportunity to reach maximum acceleration within 75 meters of starting. Our eCar finished 13th while the cCar finished 29th. The day could also be used for testing prior to the autocross competition. At 1:30 pm the drivers were given an opportunity to see the course and gauge speed for cornering. Subsequently, each car had a total of four rounds spread across two drivers. Giving each driver two chances at driving the course as quickly, and with as little penalty points as possible before passing through the checkered flag. The eCar positioned 11th and the cCar managed to complete the fastest combustion run in its last lap, also securing a spot in the top 5 Endurance run tomorrow. The final day of FSG started at 7:30 am. We attended the last team briefing, after which our drivers made their way to the endurance course walk. 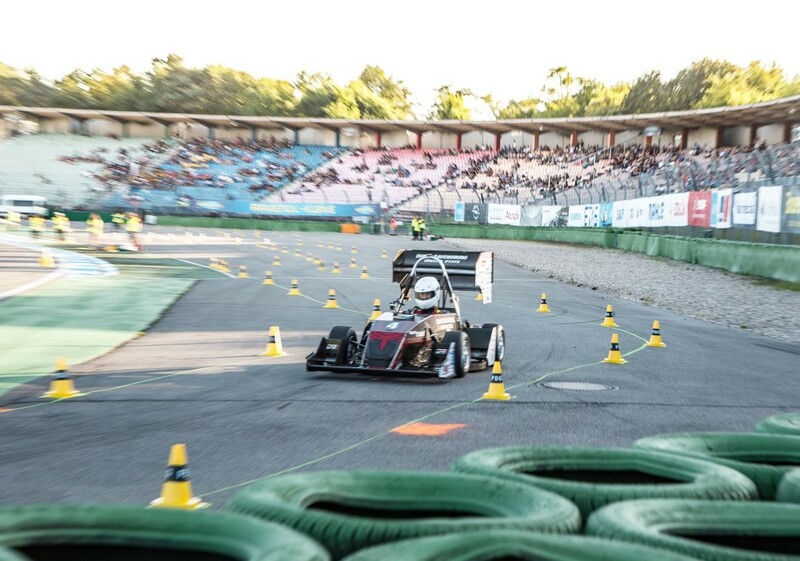 The endurance event requires an entire day in order for every team to have a chance on track, and the day ends with the top 5 cars from autocross facing off in the evening. 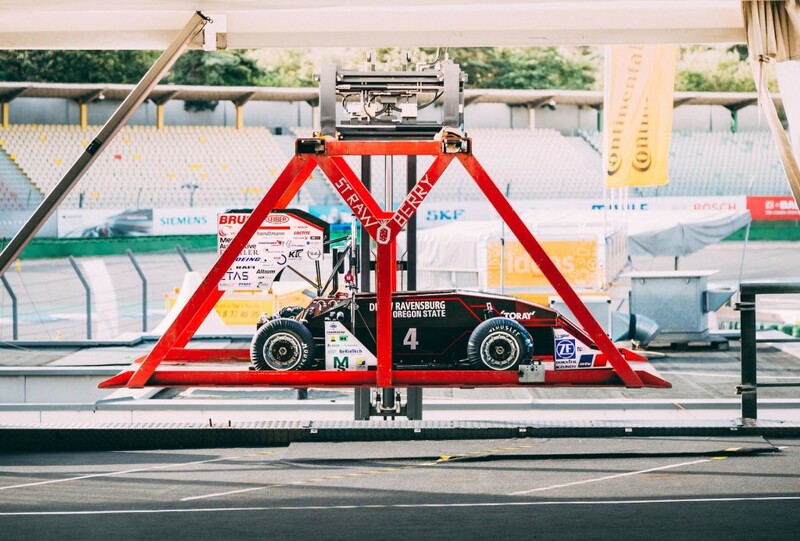 Each car has to change drivers in the middle of the event, which presents a huge challenge for many teams. As the second driver tries to restart the car every member of the team is a picture of utter concentration. The eCar started its run at about 4pm. Lap times looked good, and we managed not to hit too many cones. With a solid run and a smooth driver change we nabbed 1st place in energy efficiency and a strong position in Endurance. Unfortunately problems arose with the pedal assembly in rescrutineering, which left us staring at a DNF/DQ (did not finish / disqualified) in endurance and efficiency. Needless to say this was put a strain on the morale of the team, but we had to keep our focus as the final five approached and our cCar prepared to hit the track. 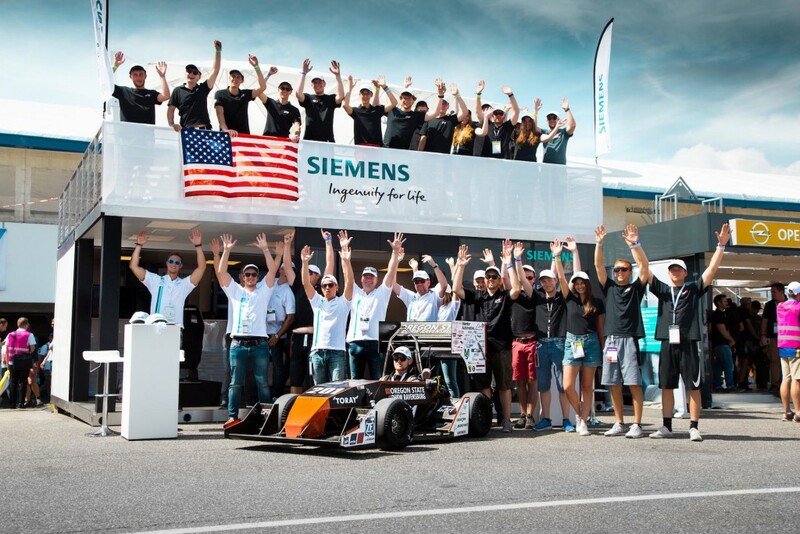 It started at 5:00pm and all team members went to the stands to cheer for our car. The first half was promising as our first driver tallied some impressive lap times, but at the driver change everything went wrong again. Problems with the battery prevented the car from restarting, which meant we were looking at a second DNF for efficiency and endurance. Both cars lost a mound of precious points with these results, and in the end we had to settle for and 11th place overall finish with the eCar and 24th overall with the cCar. 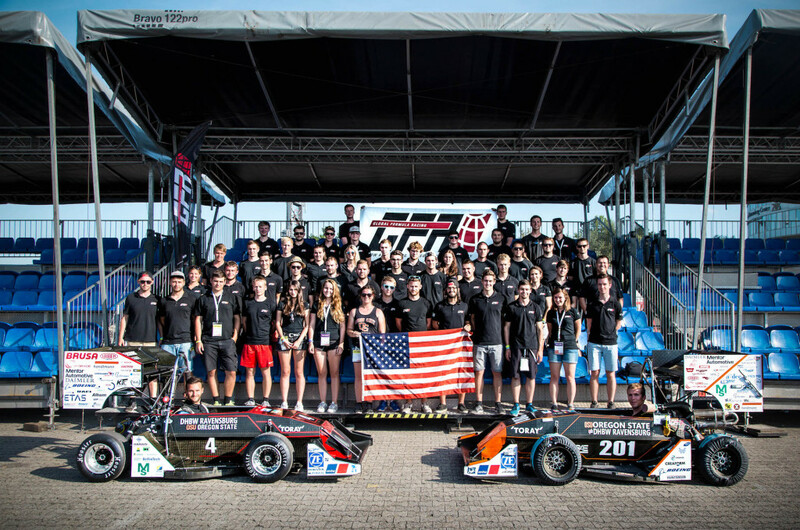 These weren’t the kind of results we had hoped for here in Hockenheim, but we can still look back on great results in the Business Plan Presentation with both cars,a 2nd place in eCar Cost Report and a 1st place in cCar autocross. This season’s tough results give the team the motivation to dig deep and come back ready to reach our goals in 2017 – GoGFR!